Hi! It's my birthday today! That is awesome! I am thirty! Unfortunately, I have to make a presentation to a Planning Board tonight. Boooo. Luckily, it is a tiny, insignfiicant project, at a laid-back, developer-friendly town. So we should be out of there quickly. Dear god I hope I didn't just jinx myself. I had a party this past weekend! Unfortunately, I was a dummy and did the age old no eating + vodka shots combo, and I passed out at like 12:30am and missed most of my own freaking party. BOOOOO. I am such an idiot. Oh well. Hopefully everyone had a good time. And I did too, during the part where I was awake! I got to wear my old Halloween costume. And Obi Wan is my boyfriend. So it can't be all bad. 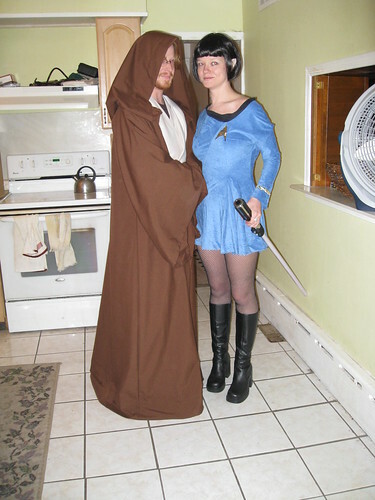 It had a theme, you see: Star Trek vs. Star Wars. 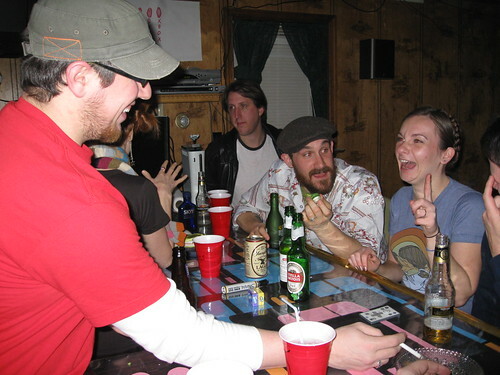 Some people actually came in costume, and most everybody else wore something festive and Star Warsy. Mitchell was Zefram Cochrane! I knew I could count on him to back me up. But so if you came, thank you very much for coming to my party! And getting into the spirit of things! And bringing presents! And cake! I'm sorry that I did not get to say goodbye. You guys are the best! Also thanks to everyone (mostly Manse residents) who helped me set the place up for the party, including the installation of an Okudagram on the bar. Tomorrow Chris is taking me out to dinner a fancy steakhouse in the city. This weekend I will see my parents. I have the greatest friends in the world. In three weeks I will be on a plane to Amsterdam. Being thirty is great so far! Also, that dude makes a great Zefram Cochrane. I hope he hit a jukebox at one point during the night and then flailed his arms crazily. He probably did that after I fell to sleep. Eh, I fell asleep right away anyway. And we never got to the pinata! Thank you! And oh man, thanks for the gift! I am pretty excited about it. Now I just need to find a cassette player. Happy Birthday and sorry we ended up bailing on you, but you look so amazing with that wig! I've always wanted my hair to be straight enough to have that haircut. If your Year 30 is like mine was than, "Oh, The Places You'll Go!" Happy Birthday! Great theme, great costumes, great decorations. Chris' robe/tunic was spot-on (beard didn't hurt either). Thanks! 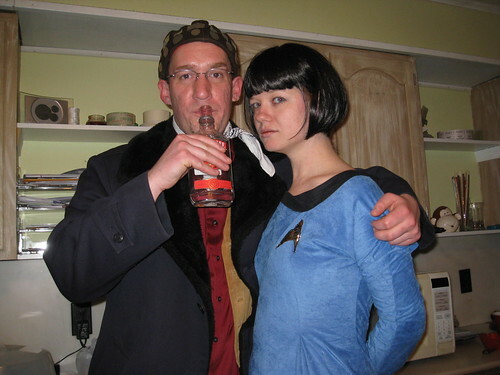 Maybe we'll play pin-the-com-badge-on-Spock's-uniform some other weekend. happy birthday Kerry! you look very skinny in that picture. did I know you were going to amsterdam? that doesn't sound familiar! dude! I wish I was going with you. Thank you! And thank you for saying so! And yes, actually! At first we thought that Chris and I would be your first visitors, but then our dates got pushed earlier, and yours pushed later. It is going to be pretty chilly over there, I think. that party looks awesome... the okudagram was a nice touch! Yeah, I was immensely pleased with how that turned out. I hope it lasts a few weeks. And it glows under black light! I have requested the Capital Grille. I am excited! I already happy birthdayed you, but have another! I was mostly just commenting to mention how insanely weird it was to click a link and unexpectedly see Ben. I can't even explain why; I mean, I know you know the guy and everything! Life goes on in America without you, Manning. Though surely it is an emptier one. Happy Birthday! You look ADORABLE in your costume--I'm sorry I couldn't go to your party!!! Have fun tonight. Girrrrl, that is pretty much totally understandable! And thanks! I am jealous of the party! I know, it is such a bummer you guys didn't make it! I'll be sure to invite you for my 40th.